[MT] WARNING: System of star "RSC 0-0-0-31-1072-4-1828-107" appears multiple times in the render list. This is repeated multiple times and revisiting the system shows no atypical graphical glitches, so I'm assuming this error is irrelevant. Could it possibly be a driver issue? I'm using 365.10. This is definitely a strange message. I could well imagine that it has something to do with it. It seems to indicate that something is wrong with the memory organization. But the message could also be caused by add-ons. If you are using add-ons. About the graphics driver I can not say anything. I do not have Nvidia card. Maybe you could post your 'se.log'. Best when just such an bug has occurred. Have you occasionally also such messages as in the screenshot? Such glitches I get regularly when I'm working with the planet editor. Could it possibly be a driver issue? I'm using 365.10. It could indeed. Last release I see it's 372.54 for my card, try updating. Well, this may be stuck joystick/keyboard button which is bound to "look left/look right/etc" action on the Camera controls tab in the Controls settings menu. Clear the cache, and never install new SE version in the same folder as the previous one. This is normal. 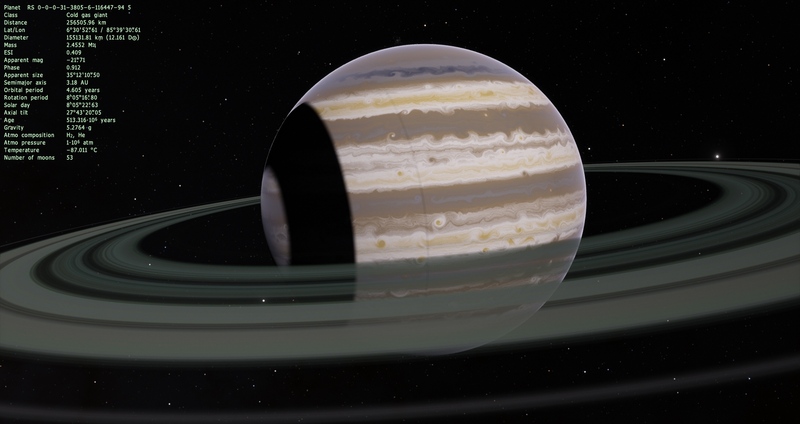 As well as turning gas giants into a detail-less ball if switching off clouds. This is the Steam version. Should I delete and redownload? Should I delete and redownload? Then delete the folder 'cache' in the 'SpaceEngine' directory. Only this folder! Jackdole, your making the Tyche system? When will it be released? I hope I'm posting in the right place. If not, feel free to delete this. I've installed .980 version and can't get it to open. Every time I try to open it I get a message that says the program has stopped working. I'm using Windows 10. Any ideas why it isn't working for me? Beta Cancri's csv star is not being removed by the catalog binary star for it. rla1958, could you please attach your se.log as explained in the first post? I installed the version 0.9.8, but all the planets and stars are invisible or transparent, even after installing the SolarSystem HD addon. Screenshot and logfile is attached. Your Intel graphics card is too old. I think to work with SpaceEngine 0.980, it must be at least 'Intel® HD Graphics 4500'. The OpenGL version is too old.